1.Fold a piece of A4 acetate in half; stick the two short sides together with double sided tape on the inside of the acetate. 2.With the opening at the top, add the sequins to the acetate pocket punch some flowers and hearts and add those too. Seal the opening. Tip: make sure all of the sides are adhered securely with strong double sided tape. 3.Add strips of paper around the border to hide the tape. 4.Measure a card rectangle the same size as your acetate window. Ensure to add an extra 1cm to the longest length, score and fold to create a flap. Cover with patterned paper. 5.Glue the flap to the top of the acetate window to create a complete card. 6.Add a sentiment topper to the centre of the card, on the inside. 7.Add a piece of lace to the top to finish. 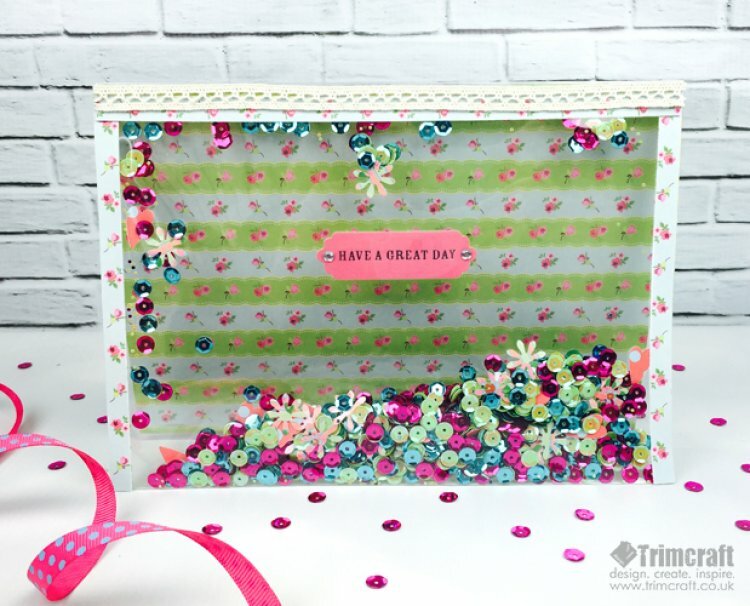 You can fill your card with different coloured sequins or die cut shapes. This is the perfect card to experiment with, so that you can create different designs for various celebratory occasions. Don’t forget to upload your finished projects to our gallery!